I’m hoping you can help me. I’m a busy mum of three; two boys aged 8 and 6 and a 3-year-old girl. I love being a mum but at the moment I am feeling really sick of everything. I’ve recently gone back to work part-time and feel like all I do is rush around trying to keep all the plates spinning. What I would really like some advice on is getting my children to LISTEN. I suppose it’s normal but it’s driving me insane that I have to repeat myself so many times before anyone does anything. I don’t expect the little one to do as well but why can’t my boys just do as I ask sometimes? I know that I’m under more pressure being back at work and I’m being a snappy, shouty, no-fun mum but there has to be something that can make it easier. Wow, it’s easy to understand why you’re feeling so burnt out - you have a lot on your plate! You’re right in thinking that there are things you can do to get your kids to listen more but it might also be worth taking a look at the bigger picture and consider how you're feeling too. You've acknowledged that you're currently feeling stressed out and you understand the impact of this on your parenting. Having three children of different ages is a real challenge in itself without any additional responsibilities. The ability to meet all their needs whilst still meeting your own is the key to your dilemma. Often when we start to feel burnt out and begin to notice the impact on our behaviour it's because the gap between how we want things to be and how they actually are has become too wide. When this happens, it can be hard to see a way forward and we can get stuck in a negative cycle. First of all, give yourself some credit for everything you are managing! Dr. Laura Markham, a clinical psychologist and gentle parenting expert, recommends that parents learn what they can let go of. She describes the season of parenting young children as a time in your life when other things may have to fall by the wayside in order for you to be able to fulfil your parenting role. That doesn’t necessarily mean being a stay-at-home parent but it does mean giving yourself a little grace when it comes to other responsibilities like housekeeping or supporting others outside the family. See this as giving yourself permission to focus on one of the most important aspects of a family - relationships. 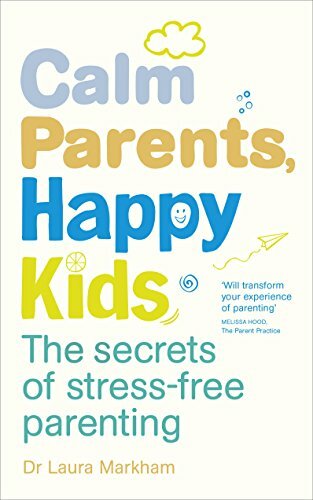 Dr. Laura’s book, Calm Parents, Happy Kids is our number one recommendation for parents looking to nurture a more mindful approach to their family life. Are there shortcuts you could take with meals? Could you accept the house being a little less tidy? Do you just need to say no more to external commitments and focus on your family in the short term? The chances are that your kids are just behaving like kids, but that because you're feeling stressed you get pulled into a negative response of nagging and shouting. This in turn makes you and the kids feel more disconnected and they're even less likely to listen. Because at the heart of your issue is connection. When kids feel connected to us they're more likely to listen, be better at compromising and generally be more co-operative. First of all, we take care of our own needs. Is it possible for you to get anything that feels like a break? I know how challenging this could be with three children and a job! But it might be as simple as downloading some podcasts to listen to while you drive to work or investing in a meditation app on your phone and beginning to practise for a few minutes a day. Perhaps even meeting a friend once a month on a Saturday morning. The fact is that without filling up your own emotional cup, any strategies for better listening from your children are likely to fall flat. It’s hard to emphasise how important it is for you to parent from a good place. What’s also important is to try and make more time for fun! The next step is to stop thinking about everything that needs doing and have some fun! When we engage with our kids wholeheartedly even for just short periods of time we can see a remarkable change in their behaviour. In an ideal world, you'd even have a little one on one time with each child but that might feel like too much of a stretch at the moment. Take a few purposeful moments each day to slow down and engage by playing, listening, dancing and eating together. A great time to make sure that you're really present is the bedtime routine. This is often an especially challenging time because we as parents feel tired and ready to relax but often the harder we try to rush it, the more our children resist! Once you've done some of the hard work and focused on filling your own emotional cup and connecting more, there are some strategies you can use to get your kids listening. RELATED POST - THE NUMBER ONE REASON FOR DISCONNECTION IN YOUR FAMILY. That might mean going closer and using physical touch to make sure that your kids are looking and listening before you speak. It might help to make a comment on what they're doing before directly asking them to listen to you to make sure you have their full attention. Again this is because kids are more likely to listen when they feel connected. When it comes down to it this is really just a more respectful way of communicating and respect goes a long way. Shouting instructions and threats from the next room simply isn’t respectful or very effective. Adults are prone to over-explaining or talking for longer than is necessary. Instead of talking about what you don't want them to do (sentences that start with a 'No', a 'Don't' or a 'Stop'), either state what you see or what you want them to do in the shortest way possible. Linked to the point above, another good idea can be to pare down your non-negotiables. Kids stop listening when every interaction is an order or barked command (after all, wouldn't you?). Keep your expectations realistic, when is it really important that they listen or do as you ask? Focus on those times first. Up the positive interactions as much as you can and save their listening for when you really need it. Using a more playful and fun style of interaction such as making tasks into a game often has more success as it taps into our child's natural way of being. Children's brains don't work like ours and they aren't able to plan ahead and organise tasks in the same way as us. Being funny or silly will often get a much more positive response. Try talking to your children's toys or getting them to correct you (“No mummy, pants don't go on heads!”) to engage co-operation. When we become overwhelmed our sense of humour is often the first thing to suffer. We get snappy, uptight and blow things out of proportion. Two minutes spent dancing to a song in the kitchen might buy you more co-operation than you think. Often when we feel our kids aren't listening this is exacerbated by the fact that we're repeating ourselves. Routines cancel this out - if kids know what happens at breakfast time, before school or a bedtime there is less need for repeated instruction. Doing things like making a visual schedule for your older boys for tasks that need to be done before school means that you can put the ball back in their court and ask them to check for themselves. This transfer of responsibility can be a weight off your shoulders but also helps to teach your children valuable self-management skills for the future. If stuff doesn’t get done then instead of nagging let them feel the natural consequences. Start with you and the rest will follow. Hopefully that’s given you a few ideas for how to get the situation back on track. It sounds like you know what's going on; you've just become a little stuck in a rut because of your own feeling of overwhelm. If you'd like to connect with other parents who want to parent in a more mindful and connected way you can join our private Facebook group Mellownest Mindful Mothers for chat, resources and support. After all parenting is the toughest gig going - we could all use some backup!